Sign up to be the first to hear news and see our most recent weddings and tips and tricks to host the most amazing wedding! Elegant Affairs was launched in 2005 by Lori Losee. Lori realized her love for event planning at a young age. This love was further solidified when she became a member of the Alpha Phi sorority at Washington State University. It was that time that Lori was able to get her feet wet by planning charity and social events. Lori graduated from WSU with a degree in Communications with an emphasis in Journalism. She worked in the newspaper world for four years before she began her new career in event planning. It was after planning her own wedding to her college sweetheart in 2003, she realized that her heart was really in the wedding industry and Elegant Affairs was born. Her family has expanded to include her sons Grant and Jackson. Lori brings a unique mix of business savvy and creative vision that has consistently translated to flawless, stylish and memorable events. Her passion for weddings, attention to detail, and all around people skills, makes her the perfect addition to any couple's planning experience! ~I love Disneyland, like almost an unhealthy obsession! I have never been to Disneyworld though. What don't I love about weddings? I still remember the first wedding I went to as a child and saw just how much fun they are. Then planning my own wedding to now help over 200 couples plan their big day makes me giddy. I am such a wedding nerd its not even funny. I love seeing my couples come together as one and join their families and friends and have a great party to celebrate. Really getting to know my couples and growing our relationship even beyond wedding day and calling them my friends. I have been to countless baby showers and birthday parties and even Girls' Nights. Truly I have been blessed with the most amazing couples over the past 12 years. It has to be when I reveal the "reception" room to my couple for the first time, just them two. I love seeing all of the emotion when everything has come together. Lots of tears, smiles, laughter, thank yous and hugs. It just reminds me just how much I love my job. Oh there were so many. One that really stands out is before I walked down the aisle, I got to talk to my grandfather who couldn't travel from Eastern Washington to my wedding and he told me good luck and that he loved me (and coming from this man he never shared his feelings so this was huge) and that was the first tear I shed that beautiful yet extremely hot June day. I walked down to Canon in D. I learned how to play this song on the piano when I was younger and always knew I would walk down the aisle to this song. For my wedding there were four songs that I need to have at my wedding. The other three were All I Ask of You from The Phantom of the Opera and Sunrise, Sunset from Fiddler on the Roof (this song was always sung at my parents wedding) and Ave Maria. 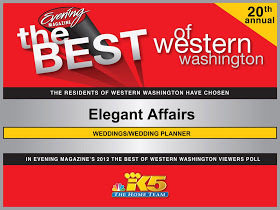 Hi my name is Lisa Owens and I am extremely thrilled to join the Elegant Affairs team. I began working as a florist here in Tacoma. My passion for floral design in weddings and special events began to flourish. I graduated from Tacoma Community College with my degree in Business with an emphasis in Wedding Planning. I was then given the opportunity to intern as an Event Specialist at the Tacoma Art Museum. Overtime I learned many event logistics which included weddings, corporate events, holiday parties, and birthday celebrations. Since 2010, I have executed creative and unique weddings and events. I look forward to sharing my knowledge and experience with the team at Elegant Affairs and working with our couples, making their experience unforgettable! ~My first full time job was a Floral Manager for 3 Albertsons stores and a florist at Lund Floral. ~I planned my first wedding in 2010. ~My Honeymoon was celebrated in Thailand. My passion for weddings is driven from experiencing the outpouring love and support for my couples, as family and friends gather together to celebrate two individuals becoming one. After months of planning and at the end of the day, my heart is full when I see smiles on everyone’s face and my couple leaving happy and married. My favorite part of wedding planning is when I meet with my clients, especially to walk through their venue. Seeing a venue as a blank canvas allows me to focus on my couples vision, have attention to detail, and use creativity and personalization to make it unique to them. (Gotta love Pinterest boards) I enjoy having my couples visualize the before and after when the special touches are all then brought together, making both their ceremony and reception unforgettable. My favorite part of the wedding day is when the couple reveals themselves to each other, whether it is during the first look or when their eyes meet walking down the aisle. Time stands still as they embrace each other, as if no one is there but the two of them. It’s the tears of happiness and adoration in their eyes, pure joy radiating from their smiles, and love filling their hearts that make it such a beautiful and special moment. My husband, Adam sang A Cappella, "Grow Old with You" from the movie Wedding Singer. He changed the words to reflect the two of us, making it memorable. This was truly the best and sweetest wedding gift. I walked down the aisle to "Marry Me" by Train. It was performed by my two cousins sang and played the acoustic guitars, as well as a very close family friend on the keyboard. It was very special to include them as part of our wedding day. We offer a no obligation consultation so we can better understand your wedding vision and planning needs!